Sharkey is a teenage ‘Sunker’. His people are submarine dwellers who, for three hundred years, have been avoiding the ‘ghosts’ who hunt and destroy people who use machines. The Sunkers remain underwater by day and surface to replenish their air and power supplies by night. Sharkey and his little crew are on a small submersible when the last surviving underwater mother ship is bombed and sunk. Now is Sharkey’s time to be a real hero, but can he unwind the web of lies he’s created over the years? And what does he do with the young ‘ghost’ they rescue from the water? Is it true these ‘ghosts’ are just people too? Meanwhile, Petrel and her companions (from the Ice Breaker, book 1 in the Hidden series) are struggling on land in their mission to find Finn’s mother and an all-elusive Song. They realised they’ve been double-crossed when their scheduled pick-up doesn’t arrive. Are they doomed to be stuck on land forever? The two groups are destined to cross paths, but will it all be too little too late to save Sharkey’s people? And what about the ‘ghosts’? Lian Tanner is a master storyteller. She weaves a complex, high action tales that are easy to read and always fast moving and her fantasy worlds are so detailed, they are completely believable. 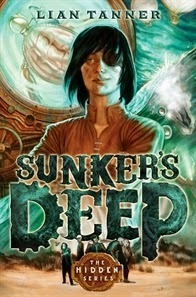 Like all of Lian Tanner’s stories, I just couldn’t put Sunker’s Deep down. See our review of The Hidden series #1: Ice Breaker here.